Summertime can be tough on your carpets, especially if you have kids home from school for the summer. There is a lot more wear and tear on the carpet when there are so many more people in the house during the day; chances are it wasn’t just your kids running through the house, either, but their friends joining in the fun. And while the memories that you make in the summer with your kids are worth all the wear and tear on the carpet, it’s still good to give your carpet a little TLC when school starts up again. If you’ve noticed that your carpet is looking a little rough now that the summer is done, here are some tips to revive it from our carpet cleaning team in Casper. Give it a thorough vacuuming. There is no doubt that you did your fair share of vacuuming over summer vacation, but you probably primarily hit the high-traffic areas. Now is the perfect time to do a really thorough job of vacuuming every square inch of carpeting. You might even want to remove some of the smaller items from your room so you have direct access to more of the carpeting. Vacuum in straight lines, making sure to overlap the last line as you pull back. 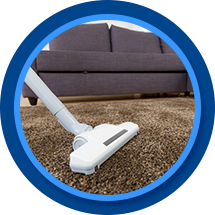 Don’t forget to empty your vacuum canister or change the bag before you start so you get even better suction and can remove more of the summer grime that’s hiding deep in the carpet fibers. Lay down some rugs in high-traffic areas. If you are starting to see areas of your carpeting that is looking worn out, it’s probably because those areas get walked on more than the areas. The additional friction from feet and shoes, as well as the additional build up of dirt in those areas, can cause the carpet fibers to wear out faster. You should consider investing in some area rugs to lay down over those high-traffic spaces. That will help prevent the carpet from wearing out faster so you don’t have to replace it as quickly. Good spots for area rugs are in doorways and along hallways. Identify those stains before removing them. No doubt there are some new stains that have mysteriously appeared on your carpeting over the summer. Don’t just jump in with your favorite spot remover and start spraying; you could actually end up damaging the carpet or making the spots worse. It’s a good idea to try to identify the stain first; then you can research the best way to remove it from the carpet. If you can’t figure out what made the stain, try an all-purpose stain remover or a mixture of vinegar, water, and baking soda to get it out. Always be sure to test any cleaner you are going to use in a discrete corner of your carpeting first, though, so make sure it’s not going to damage it. Sprinkle the carpet with baking soda. Stains probably aren’t the only summer after affect your carpet is suffering from; it probably doesn’t smell that great, either. Bare feet, wet swimsuits, muddy animals, and late-night movie snacks are all great for memory-making, but they are less great for the smell of your carpet. You can get those smells out by generously sprinkling a layer of baking soda on your carpet. For extra stubborn smells, gently work the baking soda into the fibers with a carpet brush or a broom. Let it sit for several hours and then vacuum up all of the baking soda. The smells will disappear! Finally, the end of summer is a great time to have your carpet professionally cleaned. That way you can have the pros take care of all of your stain removals, refresh your carpet, and banish smells, leaving your carpeting looking and feeling like new. You should ideally have your carpets cleaned at least once a year (more often if you have pets and kids in your home often), so back-to-school time is a great time of year to give your carpets a fresh start. Need your carpets cleaned in Casper? Get in touch with our team today for a free quote on our carpet and upholstery cleaning services.